Discoveries offers world-première recordings of works by Ralph Vaughan Williams and an insight into him as a visionary, as a romantic, as a patriot and as a lover. The works presented here span his entire working career, from the Three Nocturnes of 1908 to the Four Last Songs composed fifty years later. What unites them is that living composers have been involved in realising them in their present form. Three composers, Anthony Payne, Adrian Williams and Philip Lane, combine an understanding of Vaughan Williams’s music with a deep love of it, so that the additional writing enhances rather than conceals or modifies RVW’s original. Discoveries don’t come much more rewarding than Vaughan Williams’s Three Nocturnes. Now Anthony Payne has orchestrated the remaining two – and a marvellous job he has done, too, bringing out every adventurous facet of this often astonishingly forward-looking music with its pre-echoes of A London Symphony, Sancta Civitas and (especially) A Pastoral Symphony. Payne’s consummate understanding of the idiom is also evident in the deeply touching Four Last Songs (to words by RVW’s wife, Ursula), where he skilfully incorporates orchestral techniques employed in the Sinfonia Antartica and questing Ninth Symphony. Roderick Williams and Jennifer Johnston are on stellar form, while Martyn Brabbins and the BBC SO give of their very best both here and in two purely orchestral offerings. Of the 11 film scores that Vaughan Williams penned between 1940 and 1956, only one was lost: Stricken Peninsula is a short propaganda film from 1945 about the Allied Armies’ aid efforts in southern Italy, and Philip Lane has fashioned some of the best ideas he was able to hear behind the narration on the original soundtrack into an eight-minute ‘Italian Rhapsody’. Last, but definitely not least, comes A Road All Paved with Stars: based on tunes from the 1936 comic opera The Poisoned Kiss; this sumptuous 27-minute symphonic essay by Adrian Williams does ample justice to its source material’s soaring lyricism and tender warmth. Exemplary production values bolster the appeal of this Albion release which can be cordially recommended. VW’s Four Last Songs – not a title he gave them – are all settings of poems by his wife, Ursula. The present orchestrations, made by Anthony Payne, were premiered at the 2013 BBC Proms by Jennifer Johnston and the BBC Symphony Orchestra under Osmo Vänskä. These are fine songs and it seems to me that Payne has been extremely skilful in his orchestrations. I greatly enjoyed hearing these songs in wholly convincing orchestral dress and Jennifer Johnston is an excellent soloist. Her tone is very pleasing indeed and her diction is admirably clear. I think that she identifies very strongly with the songs. VW composed music for no fewer than eleven films between 1940 and 1956. All have been performed and recorded with the exception of the music that VW wrote for the documentary film Stricken Peninsula. This short film depicted the problems encountered by the people of Southern Italy in the closing months of the war. The score has been lost but Philip Lane has reconstructed the music from an audio copy of the film; that must have been a laborious process. I presume that in fashioning the music into a Rhapsody for Orchestra he’s reconstructed VW’s scoring as accurately as possible. What I don’t know is how much re-ordering of the material has taken place. Philip Lane has done a sterling job and it’s very good that all of VW’s work for the cinema can now be heard. Adrian Williams has extracted nearly half an hour of music from the score of The Poisoned Kiss and woven it into a Symphonic Rhapsody for orchestra. The result is a delight. The Rhapsody is jam-packed with glorious melodies, colourfully scored. Adrian Williams has produced an absolutely winning concert score here and I hope it will be taken up by orchestras. All the music on this CD has been ear-opening but the real revelation is the Three Nocturnes for Baritone and Orchestra. The Nocturnes are all settings of Vaughan Williams’s great source of inspiration, Walt Whitman. … full of intense, rapturous music and the vocal line is a gift for Roderick Williams who sings the piece most expressively. This trio of Nocturnes is a major and exciting addition to the Vaughan Williams discography. Throughout the programme Martyn Brabbins conducts with great understanding and empathy for VW’s music. The production values are very high. The recordings have been engineered with great skill by Simon Hancock (A Road all Paved with Stars) and Neil Pemberton. The excellent notes are by John Francis with very valuable interpolations by the three composers who have brought the music to life on this disc. I’m inclined to think this is one of Albion Records’ most important releases to date. All devotees of this great composer will want to hear it but the Three Nocturnes make it a mandatory purchase. The orchestration of the first and third Nocturnes has been undertaken by Anthony Payne with all the very considerable skill that has marked out his Elgar orchestrations. Payne is also responsible for the orchestration of the Four Last Songs, a group composed between 1954 and 1958. 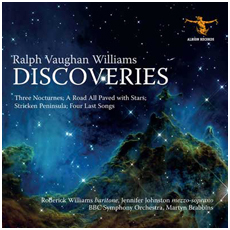 Both the Nocturnes and the Four Last Songs are examples of Vaughan Williams at his best, and I cannot imagine them better sung than by from Roderick Williams and Jennifer Johnston. Stricken Peninsula is an eight-minute orchestral work ‘reconstructed by Philip Lane from the music to a 15 minute film made in 1945 for the Department of Psychological Warfare. Philip Lane has compiled a most enjoyable ‘Italian Rhapsody’ from its rather impressive themes. These include a march for a short scene featuring an Italian marching band. The most substantial piece on the disc is A Road All Paved with Stars, rather grandly sub-titled ‘A Symphony Rhapsody from the Opera The Poisoned Kiss’ by its arranger, Adrian Williams, but in truth a compilation of the opera’s best bits. There is some lovely music here. All the music on this disc is performed by Martyn Brabbins and the BBC Symphony Orchestra, and recorded by BBC engineers at Maida Vale. The BBC band in recent years has been playing better than ever, with a silky and voluptuous string sound and perfect blend throughout. Brabbins conducts everything as if he has known the music for years, and his pacing of it is a delight. The engineers do their bit, too, by producing a warm and full sound, with a wide dynamic range. Is there no end to the riches of Vaughan Williams’ legacy to be revealed by Albion? I hope not, but Discoveries and Purer than Pearl must rank as perhaps the finest to date in a very fine series. Highly recommended.